407,000 private sector workers are about to lose most of their pensions. I first wrote about this on April 21, in One of Nation’s Largest Pension Funds (Truckers) Will Reduce Benefits or Go Broke by 2025. 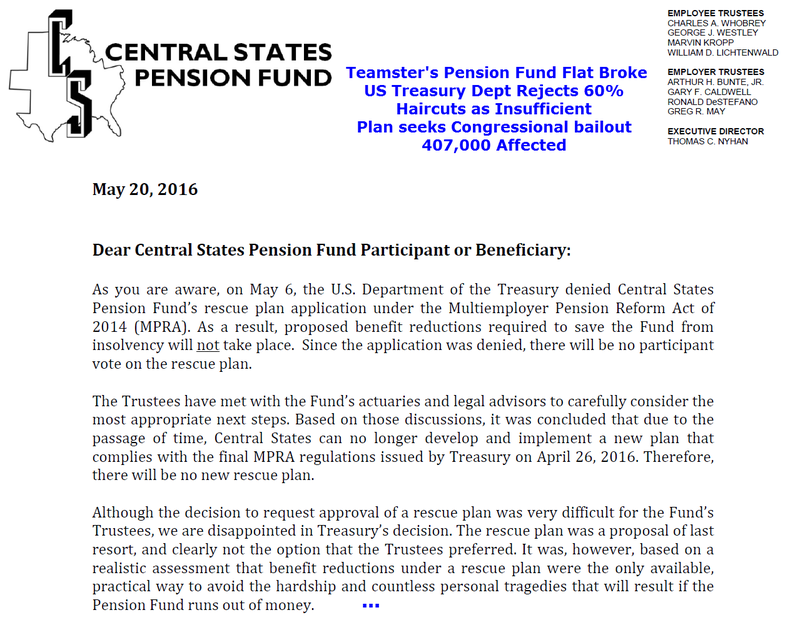 The Central States Pension Fund, which handles the retirement benefits for current and former Teamster union truck drivers across various states applied for reductions under that law. Currently the plan pays out $3.46 in pension benefits for every $1 it receives from employers. That’s a drain of $2 billion annually. The plan filed for 60% cuts in pensions. The Treasury Department has the final say. The verdict came in today: “cuts not deep enough”. Please consider Pensions May be Cut to ‘Virtually Nothing’ for 407,000 People. Click here for the entire “Dear Beneficiary” letter. This is a sad saga for which there is no happy ending. An Illinois state worker was whining earlier today about my post Chicago Pension Liabilities Jump 168%, Understated by $11.5 Billion. When private pension plans go broke, they go broke. Public pension expect a bailout. Public workers have no idea how well off they are vs. the private sector, yet they demand, more, and more and more, from a state that is broke. Taxpayers owe the Chicago pension fund absolutely nothing. Bankruptcy is the solution.